Word of Mouth is the “world’s most powerful sales tool,” according to Nielsen. In fact, most B2B companies get more than half their business from Word of Mouth. Today, thanks to social media like blogs, social networks, Twitter and more, WOM is more influential than ever. Forward-thinking marketers are boosting positive Word of Mouth by finding and activating their enthusiastic customers (AKA “Brand Advocates.”) But how do marketers harness the power of social media and Word of Mouth in B2B environments? 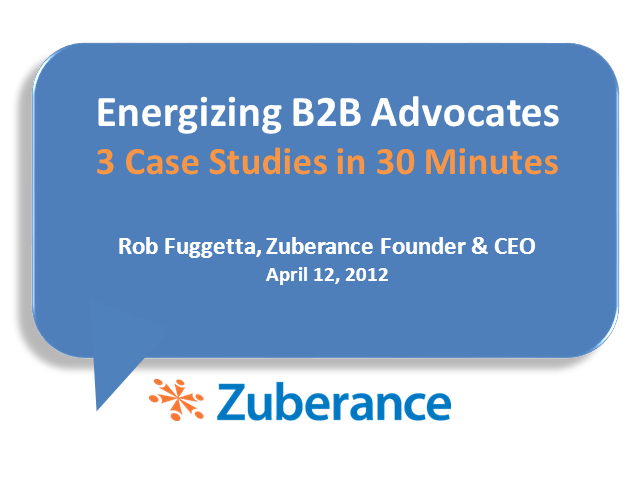 Rob Fuggetta is the leading expert on brand advocacy. He is a former partner at Regis McKenna Inc., the legendary marketing and communications firm where he co-managed the Apple account. He later became CMO at Genuity, a Verizon spin-out which went public in June 2000. Fuggetta is the author of “Brand Advocates: Turning Enthusiastic Customers into a Powerful Marketing Force,” to be published by John Wiley & Sons in 2012.